If you’ve been following our blog or social media feeds this month, you already know it’s Anne’s birthmonth. So to continue the trend, for our Friday Fun video, we are featuring her! Anne’s favourite construction method has always been throwing. Like many of us, she was entranced from the first moment she saw someone (in her case, Bill Bracker), throw a pot. Anne so enjoyed throwing that during her graduate work, every project she made included a thrown element, even if assignment was a slab or extruded object, or a sculpture, or pinch pot. She would, of course, complete the requirement, but then add a thrown spout, or lid, or some such attachment. 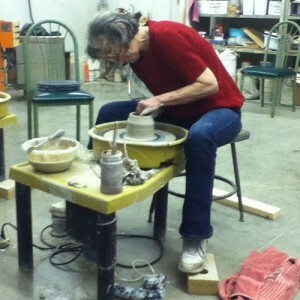 As studio potters, Anne (and Bill) owned and used a Brent Model C wheel exclusively.